Mordian 7th Regiment: Heresy Era... Imperial Fists? First up I thought I'd see if a metallic yellow might work, with a boltgun metal/silver highlight base color being washed multiple times with Cassadora Yellow wash. Interesting effect, but not quite what I wanted, and would be too streaky when applied to vehicles. Next up was a light tan basecoat washed again with Cassadora Yellow which didn't really work at all, just sort of turned into a muddy mess. Next was light tan, followed by a Golden Yellow highlight, followed by the Cassadora Yellow wash again - getting closer, but just not well defined. 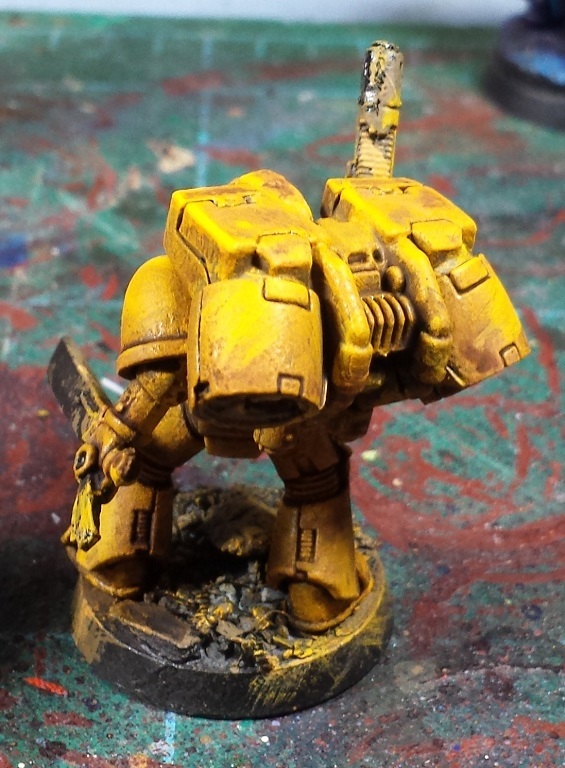 On a lark I tried a light tan, golden yellow and then an Agrax Earthshade wash, followed by a further yellow drybrush, and I think we might have a winner! One of the things I'm looking to do is push my weathering techniques a bit more, and really dig in to a dirty/weathered army with painted/sponged chips and scratches, and I'm thinking this might be a great somewhat grimy base color to work from. I want to try one more test model with a more involved light tan/averland sunset/golden yellow/bright yellow/earthshade wash/yellow highlight to see if I can push the initial yellows just a little brighter before it gets darkened down by the wash (in person the model above is a little less vibrant than it appears in the pics). I've been feeling stuck in a 3-stage Basecoat/Highlight/Wash rut for a while, and I think the models could really benefit from a few more color gradients. Definitely worth trying out some further schemes on throwaway models before committing to resin, that's for sure! Gotta say, I'm feeling the hobby mojo coming back - this could be a fun project! Nice job! Cool to see all your test minis laid out side by side like that to illustrate your different methods. 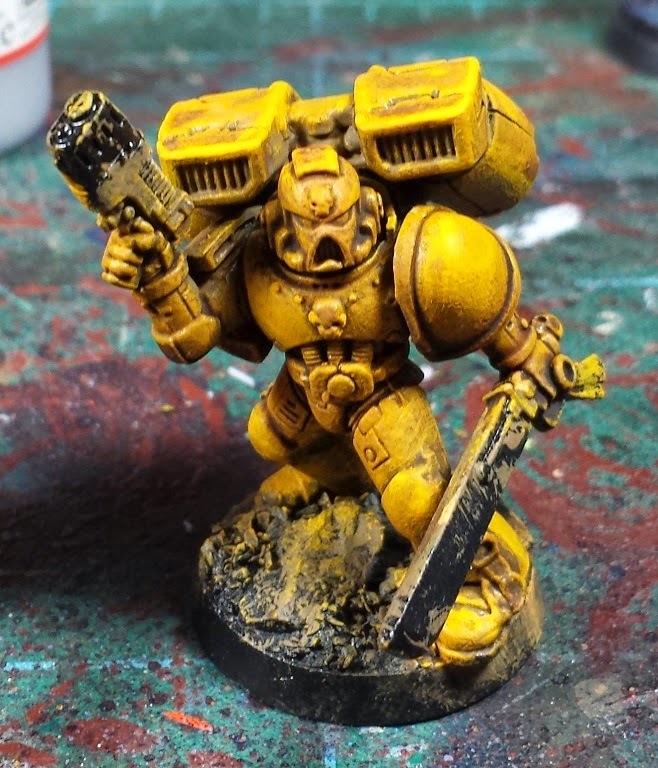 Imperial fists are one of 'those' paintschemes, so hard to get yellow right but I think going battle weathered will definitely help! Best of luck with the yellow peril, have you tested with tau sept ochre foundation? And then yellow highlights? And some good colour choices there. I'm fond of an Iyanden darksun base for my yellows, as it takes the later lighter tones well, I'd imagine that's what you're seeing from the Tausept ochre. If I'm honest any weakness of that final model isnt coming from the colour choices, but a combination of a heavy drybrush followed by a heavy wash - the drybrush gives a lot of texture for the wash to bite too, likely where you dont want it. I think an inclination towards more paint steps might help as youve suggested, but you might also see good results from changing up the application process a little. If you're taking an "army" approach here and want to keep drybrushing rather than painting highlights by hand, then consider a gloss varnish step before the wash - and dilute the wash a little more. the varnish ( i airbrush klear but any similar product would work) would give a shiny slick surface and encourage the wash to gravitate to the recesses of the model rather then let it settle in the texture of the paint. These look pretty good! The method that I use for yellow is an averland sunset base, with a heavy seraphim sepia wash, followed by a drybrush of averland sunset and then a light drybrush of yriel yellow, it gives a nice vibrant and dark yellow tone. Yellow is a difficult colour. I really like the idea of you joining the chipped and weathered ranks! Best part is you can cover mistakes with chips instead of retouching! I like the yellow - closer to the mustard that I prefer to see "Fists" in. Lots of cool HH FW minis to make this project really shiny! @Phil Morris: Thanks man! Aye - yellow is definitely a challenging color, should be a fun project though! @Karitas: Thanks so much - those are some fantastic tips! The varnish step before the wash is an interesting idea, will definitely be giving it a try. Cheers! @FigurativelyArtistic: Definitely dig the effect the Sepia wash gives over the earthshade on the recent batch of test models I've been working on. Excellent tip, thanks very much! @Zab: Hahah! Good ol' stoic Dorn. I'll give the purple recess wash, that combo never occurred to me! @John Lambshead: Indeed - I've tried a dozen different methods so far, some were rubbish, others may work well. Fun doing all the experimentation! @Zzzzzz: Definitely a departure from previous color palattes! @Dai: Thanks! Aye, definitely want to go with a mustard-y dirty yellow rather than a bright stoplight/neon yellow. Plus it allows me to be a little more sloppy and call it weathering. Hah!